mourning the passing of Eldon Shirey). 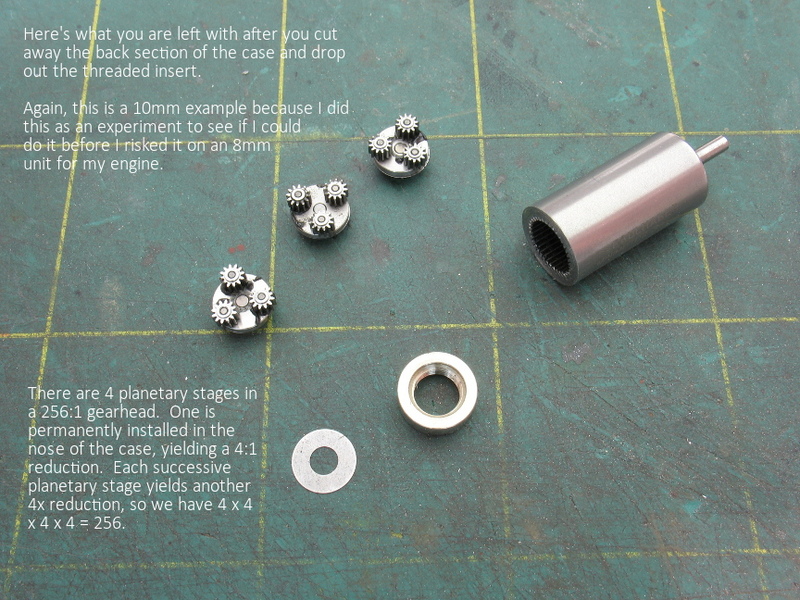 During the 0-6-0 project thread, I modified a 256:1 Faulhaber gearhead to get a 16:1 ratio by shortening the case and removing planetary stages. Those photos are repeated here, and I'll try to insert some extra text to help them along. First, a basic concept of these gearheads is that they all use stacked stages of planetary gears that each achieve a 4:1 reduction. Therefore, the total reduction is always a multiple of 4. For example, if you have only one stage, you get 4:1. If you have two stages, you get 4x4 = 16:1. If you have three stages, you get 4x4x4 = 64:1, and so on. Why they settled on 4:1 for each stage, I am pretty sure, is really an arbitrary choice based on the limitations on the size of the gear teeth and bores, and choosing a reasonable compromise that would offer a good selection of ratios. Also remember, I don't own a lathe. I only own a mill. So I did these cutting operations in the mill. 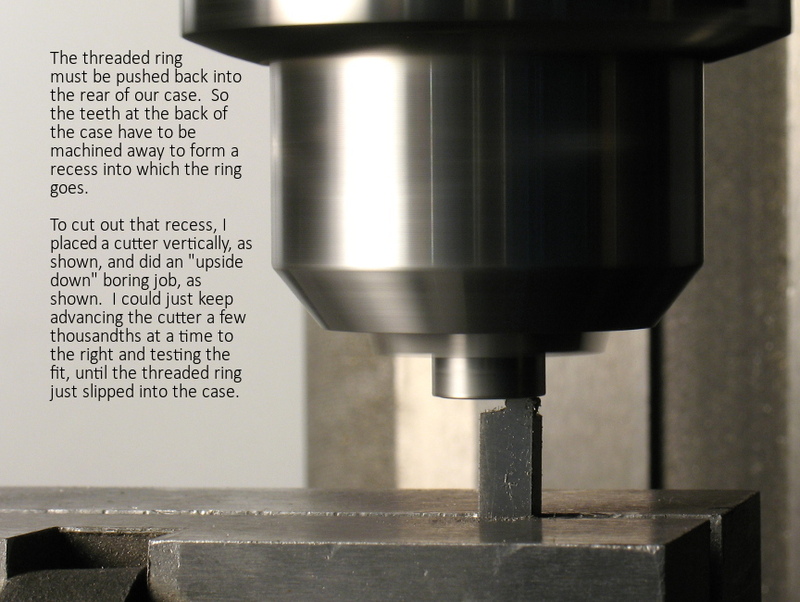 But in fact, everything I did was really a lathe operation, and it would be easier to do all of this if you have a lathe. These gearheads all have an insert that is pressed into the back of the case. We need to cut around the outside of the case just until we cut through the case, but NOT into the insert, and allow the insert to drop out. Once you cut through the case, the insert will drop out. 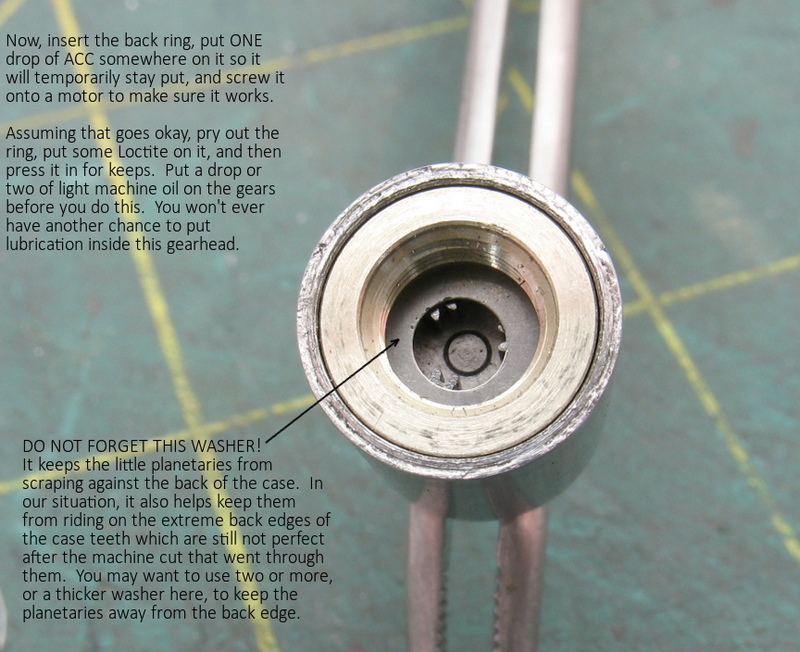 (The insert is the threaded ring at the bottom center of the next photo). All the planetary gear stages will drop out as well. It's a good idea to place a clean cup of some kind underneath as you cut through the case, because all these tiny parts will probably drop out into a mass of metal shavings under your chuck if you don't, and you will lose the little gears as well. Even with the cup, you won't lose anything but you need to clean and brush out ALL of this with a soft brush and something like acetone until all the parts are clean, the way they appear in the next photo. In this example, I was removing some gear stages to decrease the ratio from 256:1 to 4:1 (I wanted to remove 3 stages). cutter. We are trying to "part off" a section of the case. But there are gear teeth cast into the inside of the case, and as the cutter goes through, it will deform the edges of those teeth. We need to minimize that damage. Luckily, these cases are NOT stainless steel, like the gears themselves. They are actually quite a soft steel and the cutter goes through them easily. 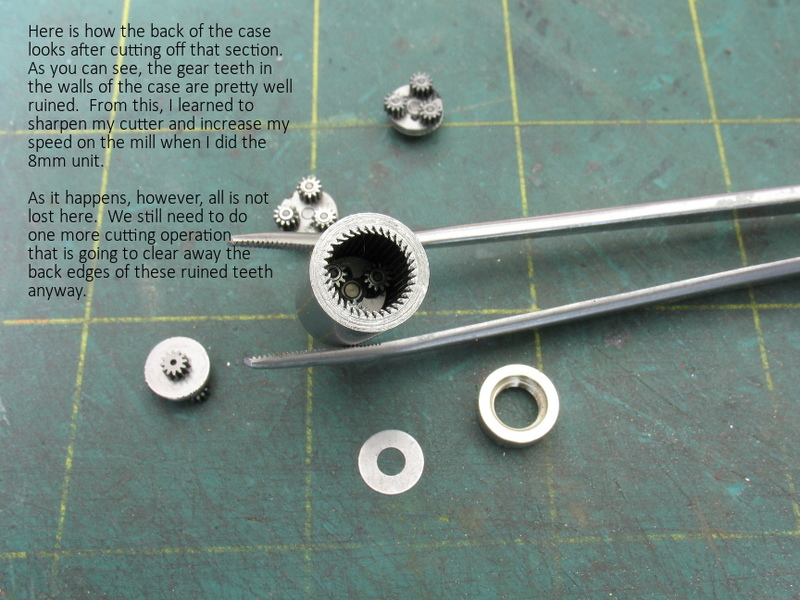 As you can see in the next photo, I really mangled the teeth at the back edge of the case. This was only the first time I tried doing this. On my next attempt, I sharpened my cutter better and ran the spindle at a higher speed, which worked quite a bit better. The case is now shortened. 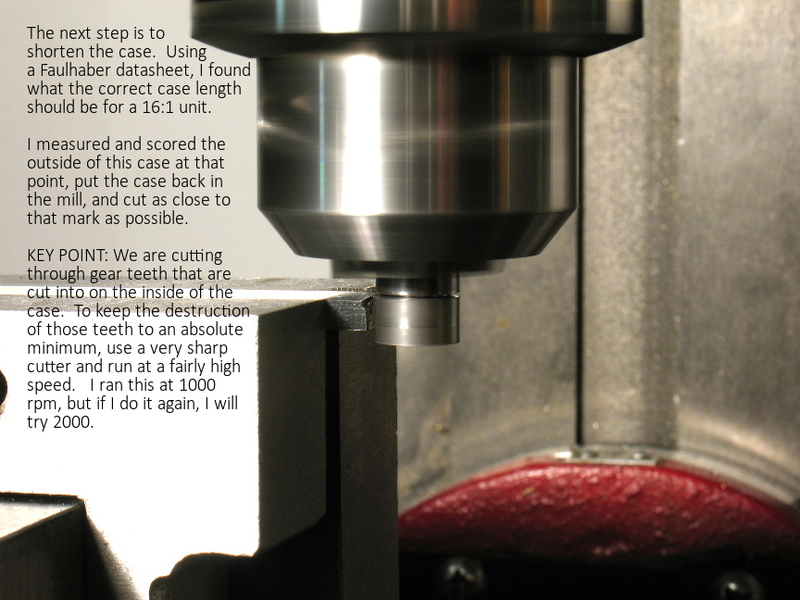 But in order to press the rear insert back into it, we have to machine away a recess in the inside of the rear of the case (right where the ruined teeth are). This is lucky, because it means those teeth I ruined won't matter - I'm going to cut them out of the way anyway. 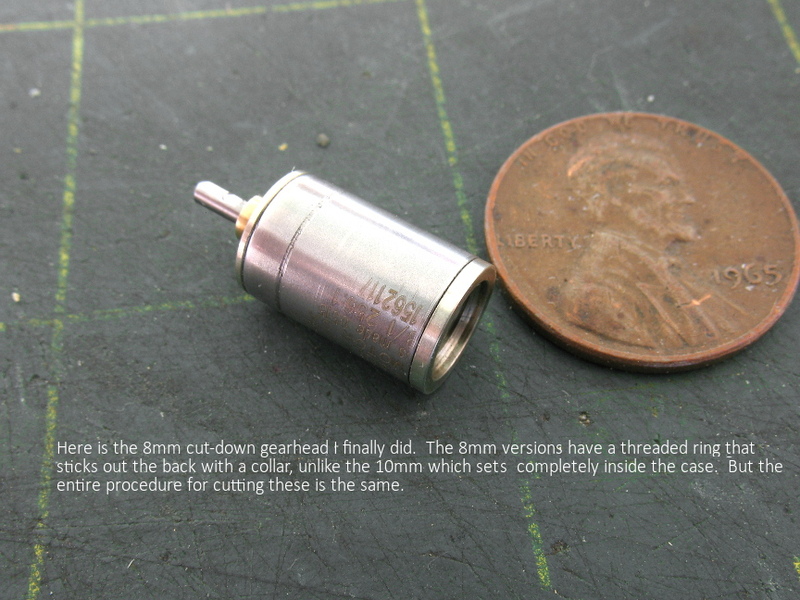 Here's the gearhead with the recess cut out of the rear, inside part of the case. And once again, as the photo captions stress, you need to make the inside of this thing "hospital clean" before you try to reassemble everything. These gears are unbelievably small, and any fleck of metal dust on a gear tooth will jam this thing up. Now, the rear insert ring can be pushed back into the rear of the case to complete the job. Somebody asked how these attach to the motors. If you look at the next photo, you can see threads in the inside of that insert ring, down inside there near the washer at the bottom. There is a threaded nose on the motors that simply screws into this hole. It's all designed very elegantly so that when the gearhead is screwed all the way onto the motor, the motor pinion goes right down the center of the gearhead and engages the three planetary gears inside the gearhead. 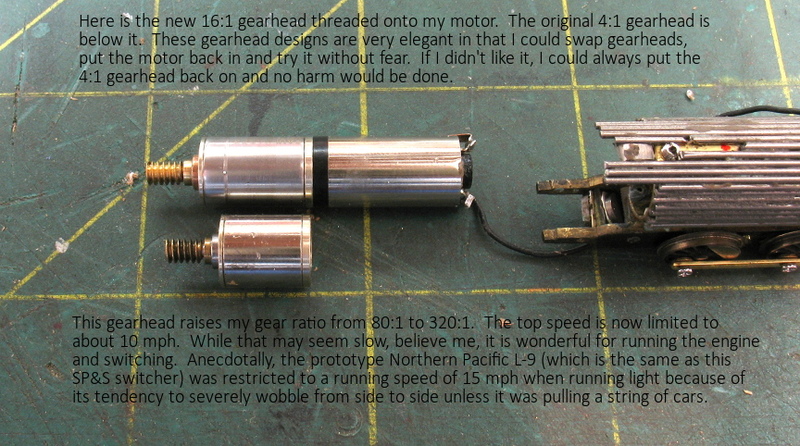 Some more photos of completed gearheads. Final thoughts. 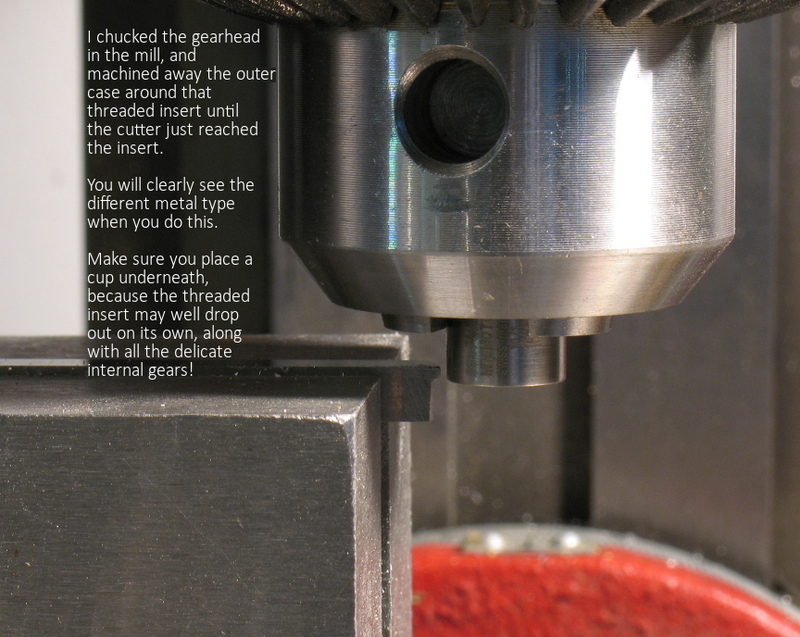 If you have a lathe and you try this, you'll know right away if you've got it right. If you can screw the gearhead onto the motor and turn the output shaft with your fingers, and it turns freely, you've got it right. 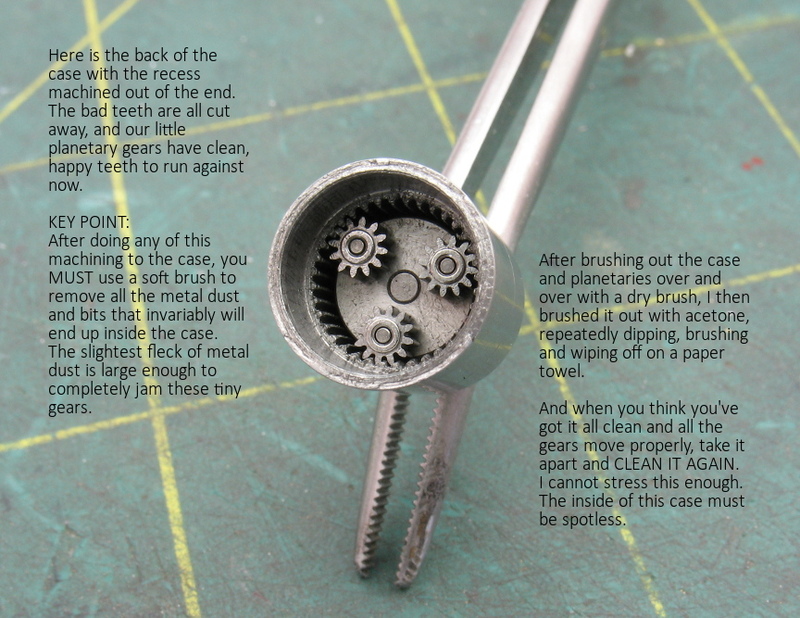 If it has a "rough spot" in the rotation ANYWHERE, unscrew it and see if you have any metal bits still down in the teeth. If not, you probably have too much error somewhere in the lathe operations. These things should always turn as smooth as glass, and if they don't, it really ruins the performance of the whole gearmotor. 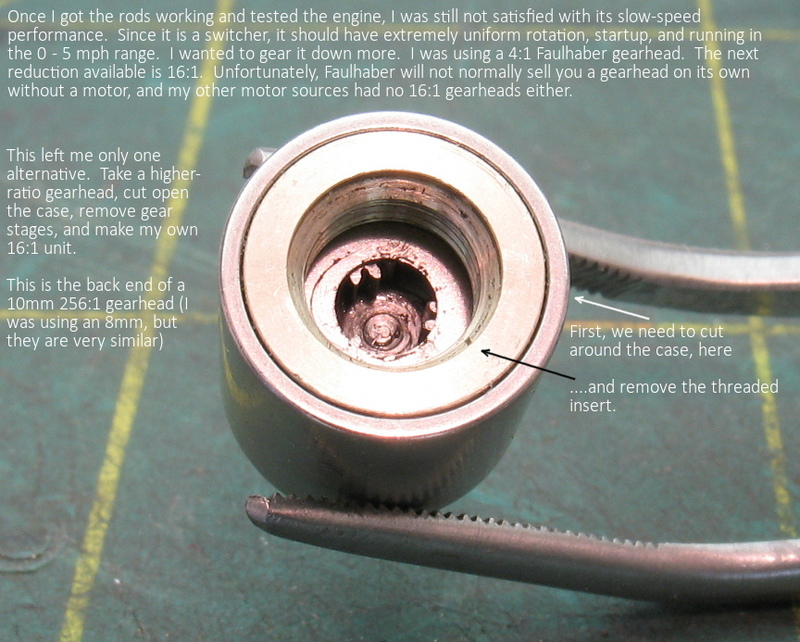 About all you can do is "cheat" a little, by unscrewing the gearhead, perhaps 1/4 turn, and then 1/2 turn, etc, and see if the rough spot goes away. You might be able to find a sweet spot where everything is smooth. If you get lucky, you can add a washer or some shims, between the motor and gearhead, and then tighten the gearhead down again, and see if it all works. This is not at all the desirable way to get it to work, but you might be able to "save" one that is botched a little. Awesome info Max! Thanks as always for your detailed photos and explanations! A very interesting read, thanks for sharing! Does anyone know of second hand or surplus suppliers of Faulhaber 1016s and 10/1 gearheads? I know some of the retail places have astronomically high prices for new ones. That is the million-dollar question. If we knew a source, we wouldn't be so crushed by the Motorman's passing. There are two sellers on eBay right now who have the 1016 for $30 - $35 (and I'm not counting microlocomotion, which was Eldon, and he is still listed on there). But they have gearheads on them you can't use (1024:1 or something like that). So you can get them, unscrew the gearhead, and now the fun begins... finding a 4:1 gearhead at a good price. That's always the hard part. There are also several sellers with 0816 (the 8mm size) for like, $8. Again, you'll have to battle the pinion gear and gearhead to really use these. 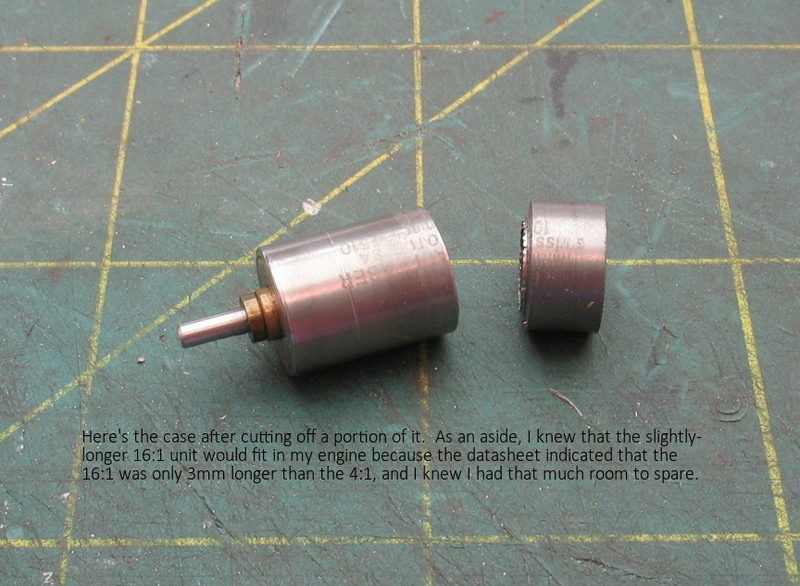 And that's why I started learning how to cut down gearheads. I feared this day was coming. And honestly, I can't set myself up to do this. The last time I did it, it took me a couple of hours just to do one, and I don't have anywhere near a 100% success rate. I can get a good one to come out better than half the time, but I'm not good enough to do it "for hire". If I had a few hundred lying around like Eldon did, I could practice my technique. But alas, a box of 100 gearheads is not a likely thing to find. @mmagliaro If somebody needs one now and could get Max to help choose the proper starter motor I could give one a try. I see this being about a $25 proposition in short quantities. The first few will take some time to get the tools, method, and gripping worked out. I'll try one with a cost not to exceed $25 and may never do another one again. I'm actually not worried about being able to do it but do fear that the effort will be more than it's worth. But I should try one as it may prove to not be so bad. Edit add: Boy that sounded negative when I re-read it. Not meant that way. If I was to guess, sight unseen but having a sense of the work from Max's description, I would put a cost range on this of $15- $25. If you were doing a few identicals at once that could probably be measurably less. Something like the mentioned numbers for the first one and maybe dropping $5 for the next one, maybe a $10 drop for the third one, and then flat from there on. I can't imagine there being any real large quantities. And I really should try one to see if this is a viable service that could be offered. And again, I'm not worried at all about being able to do it but I am just a little worried about the time it will take.